For many women to have a curly hair means a headache, because it is very hard to styling it and need more attention than a straight hair. Curly hair is difficult to maintain, become rebels immediately and haircuts are a hard choice. Nevertheless, there are solutions on how to style curly hair. In this article you will find 3 great styling ideas for curly hair that will help you to always have an enviable hairstyle. With attention and information, curly hair curly can proclaim its right of master in beauty. No matter what is the hair length, if you have curly hair you need to use conditioner every time you wash your hair. It is also important to use products that contain olive oil, coconut oil or other ingredients highly hydrating. 4. Repeat again the action with the hair from the neck base. 5. Optionally, you can apply fixative. 2. 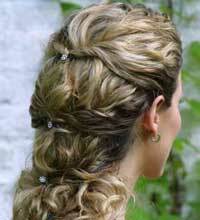 When it is almost dried, use a curler to dry your hair and leave it natural at ends like in the image.